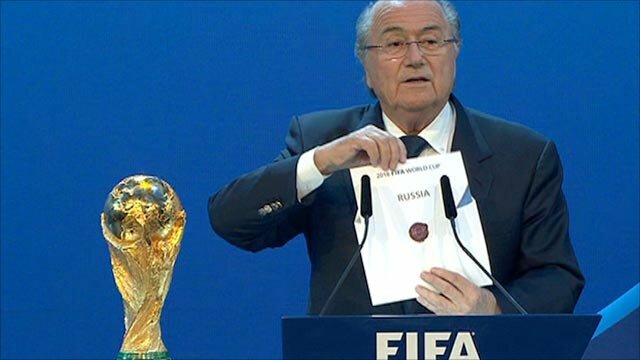 Russia and Qatar have been chosen to host the 2018 and 2022 World Cup finals respectively after a secret ballot of Fifa's 22 executive members in Zurich. Russia was selected ahead of co-bidders Spain-Portugal and Holland-Belgium and England, which won only two votes. Qatar defeated bids from South Korea, Japan, Australia and the United States. "You have entrusted us with the Fifa World Cup for 2018 and I can promise you will never regret it," said Russian Deputy Prime Minister Igor Shuvalov. Russia received nine votes in the first round of voting and an outright majority of 13 in the second round, while Qatar obtained an outright majority of 14 in the fourth round of voting for 2022. It is the first time that either Russia or Qatar has been chosen as host nation for the World Cup. "Let us make history together," Shuvalov added. Russia's selection comes despite the absence of Prime Minister Valdimir Putin from the vote in Switzerland. The 58-year-old had been expected to be a prominent figurehead for the Russian bid in the final days of campaigning but instead remained in Moscow. He is now expected to fly to Zurich to thank Fifa for what he described as "a sign of trust" for his country. "Russia loves football, Russia knows what football is and in our country we have everything to conduct the 2018 World Cup on a very worthy level," said Putin in a televised interview. "The decision corresponds with Fifa's philosophy for developing football, especially in those regions of the world where that development is needed." 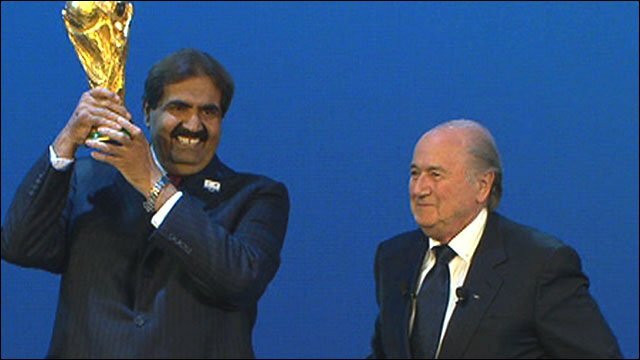 Qatar's Emir Sheikh Hamad bin Khalifa Al-Thani was in attendance in Zurich, and he thanked Fifa for "believing in change". "We have worked very hard over past two years to get to this point," Al-Thani continued. "Today we celebrate, but tomorrow, the work begins. "We acknowledge there is a lot of work for us to do, but we also stand by our promise that we will deliver." The Spain-Portugal 2018 bid gained seven votes and its managing director Miguel Angel Lopez commented: "Fifa thought it was better to promote football in other latitudes and there we are. The decision is focused on taking football to regions which have never held a World Cup." The Belgium-Netherlands bid picked up four votes in the first round and two in the second. Former Belgian star Marc Wilmots thought the decision was a negative one for football. "Russia is a political choice and Qatar is an economic choice," Wilmots reflected. "You can say that to some extent the sport has been the loser with the decision for these two World Cups." US President Barack Obama said he felt Fifa had made "the wrong decision" in awarding the 2022 tournament to Qatar. The US reached the fourth round of voting before being beaten by Qatar, and US 2022 bid chairman Sunil Gulati stated: "We're disappointed. No way to get around that. We worked very hard. "The country has been behind us in a way we haven't seen. We know it came down to two. Which automatically means it was very close. "But there's a lot of countries in the world that want to host these events. "People have figured out a way to do it and not lose a lot of money, especially if you don't have infrastructure issues. "Certainly in the two winners today there are going to be a lot of infrastructure needs and commitments have been made by the governments." Despite losing out in the first round of voting for 2022, Australia's Football Federation chief executive Ben Buckley thought the Australian bid had strengthened his country's reputation. "We are obviously disappointed at the outcome in Zurich, however we are proud of the efforts we made in trying to secure a World Cup in Australia," Buckley added. "We mounted a technically excellent, credible and responsible bid against enormous competition and this strong bid has delivered important benefits. "Australia's reputation as a potential host for such a major event has been reinforced." The tiny oil-rich Gulf state of Qatar, with a population estimated to be around 1.7m, will be the first Middle Eastern country to host a major sporting event, and a central crux of their bid centred around boosting the region's global profile. With the country's economy expected to grow by 15.5% this year and soar by 21% in 2011, Qatar is expected to spare no expense in building stadiums for the event, with the total cost of construction work expected to be about £4bn. Under proposals submitted to Fifa, Qatar would renovate three stadiums and build nine new ones, with the 12 venues divided among seven host cities. This includes the proposed 86,000-capacity Lusail Stadium, which is expected to be completed by 2019 and is scheduled to host the opening and final matches. Bid organisers said that all the stadiums will be climate-controlled and zero-carbon emitting to combat what could be temperatures as high as 50C during the two hottest months of the year in Qatar. The country has also launched a huge spending policy in recent years to accommodate its growing population, splashing out billions on rail, air and road links. Plans are also in place to complete a metro system to connect each stadium by 2017, meaning travel time between venues would be no more than an hour. Doubts remain over whether the country will be able to cope with an influx of approximately 400,000 fans. The country currently has around 50,000 hotel rooms, but bid leaders have promised that 95,000 will be available come 2022. There are also concerns that the demand for alcohol and potential rowdy behaviour from football fans could clash with the conservative social mores of a country that is still a relatively closed Islamic nation. Russia's plans for improving facilities in host cities are also in line with Fifa's long-term ambitions for developing the sport, especially in regions with outdated infrastructure. Russia has proposed staging the tournament in 13 cities, grouped into four clusters that stretch from the exclave of Kaliningrad on the borders of the European Union to Yekaterinburg in the Urals on the fringe of Siberia. Putin's promise to scrap visas was seen as crucial to his country's prospects of winning the vote as nationals of almost all countries outside the former Soviet Union require the paperwork to visit Russia. There have been concerns that Russia's vast size, its remoteness from other countries and what is seen as a relatively weak transport system could make travelling around the country problematic. All the host cities are in the European region of the country and Putin has promised that fans will be able to travel on public transport for free during the event. The results have brought to a close an extremely controversial voting procedure, with Fifa facing a number of allegations of corruption, which has led to the suspension of two members of the executive committee. A recent investigation by BBC's Panorama, which was broadcast on Monday, accused three executive committee members of accepting payments and alleged Fifa vice-president Jack Warner attempted to supply ticket touts. An increasingly acrimonious climax to campaigning saw Spanish and Russian officials issue veiled attacks on the British media for reports of alleged corruption in world football's governing body. In addition, Qatar had to endure a Fifa investigation into allegations it planned to trade blocs of votes with 2018 bidder Spain-Portugal - charges which could not be proved because of a lack of evidence.